Breaking accounting rules can now carry a maximum prison sentence of upto five years. Non - compliance with Sri Lanka's accounting standards with the intention of misleading lenders, shareholders or the Inland Revenue is a punishable crime under The Sri Lanka Accounting and Auditing Standards Act of 1995. "The standards have been made effective for all accounting periods commencing after January 1, 1999," Director General, Sri Lanka Accounting and Auditing Standards Monitoring Board, Ajith Ratnayake told The Sunday Times Business. International standards were formulated by the International Accounting Standards Committee of which Sri Lanka is a member. The Accounting Standards Committee reviews standards formulated by the IASC and make the necessary modifications to suit Sri Lankan conditions. The standards are then recommended to the Institute of Chartered Accountants which has the power to adopt the standards which are consequently gazetted. The tentacles of this fledgling regulatory body stretch wide beyond listed companies which are the domain of the SEC to insurance companies, banks, financial institutions, finance companies, unit trusts, companies which have a turnover exceeding Rs 500 million, share capital exceeding Rs. 100 million, assets in excess of Rs. 300 million liabilities to financial institutions exceeding Rs. 100 million or a staff of over 1000 employees. Director General, SEC Kumar Paul said that divisions of the SEC dedicated to monitoring standards will be able to release resources once the board commences operations. The Accounting and Auditing Standards Monitoring Board has three options for regulation. The Board may ask faulty accounts to be republished, or correct accounts the next time they are published, or take legal action against enterprises preparing deliberately misleading accounts. Enterprises are legally required to forward their accounts to the Accounting and Auditing Standards Monitoring Board. These are in turn reviewed and anything suspicious is investigated. Public complaints are also entertained and investigated by the board. "These functions of the board will make the work of the stock exchange easier," Director General of the Stock Exchange Hiran Mendis said. The board comprises 13 members as dictated by the Sri Lanka Accounting and Auditing Standards Act. They include the registrar of companies, Commissioner General of Inland Revenue, Director General SEC and CSE and ten members appointed by the finance minister including an officer of the central bank, members of the Institute of Chartered Accountants and Chartered Institute of Management Accountants. At present the board has five employees. They intend having a staff of 16 who will be divided between an administrative section and a technical section. The technical staff will consist of a deputy Director-General and three technical managers who will be chartered accountants. They will review accounts and handle complaints. A similar process is followed for auditing standards. The question has arisen whether the board can bring to task auditors for non compliance with auditing procedure despite compliance with accounting standards. "This calls into question the interpretation of the Sri Lanka Accounting and Auditing Standards Act and has been referred to the Attorney General," said Ajith Ratnayake. The Accounting and Auditing Standards Monitoring Board was formed as the Institute of Chartered Accountants which sets accounting standards felt the need for an independent monitoring body. Sri Lankan government's dominance in the financial sector has to be reduced to implement efficient monetary policy and to develop the country's capital market, a top government official said. "We need to accelerate the capital market development strategy which is essential if the financial system has to grow," BOI chief, Thilan Wijesinghe said at a seminar. "Even though lip service has been given linked to the privatisation of state owned enterprises to capital market development, not much has happened," he said. As a first step to making this link, the balance stake held by the state in Sri Lanka Telecom (SLT) must be listed soon. The government sold 35 percent equity and management of SLT to Japan's Nippon Telegraph and Telephone Corp in 1997 for US$ 225 mn. Listing of the government's balance share in SLT is held up due to various regulatory issues. "I am confident it can be done this year," he said. "It is not conducive for Sri Lanka to be a regional financial centre when the government holds some 60 percent of banking sector assets and some 90 percent of pension funds,'' Mr. Wijesinghe said. In the short term, if the privatisation of the state banks is not an option for political purposes, at least 25 per cent of the government equity in the two state banks must be listed on the Colombo Stock Exchange, subject to ensuring that capital adequacy and various other disclosures are in place, he said. He called for the quick enactment of new legislation aimed at deregulating the insurance sector "as some 45 percent of life funds are in the government's hands." A special task force appointed to prepare a new insurance law submitted its report to the government in April 1996, but since then, no action has been taken. The insurance sector was opened to private firms in 1988 after 26 years of state control and currently there are six private and two state-run insurance companies. He also said reform of the pension or provident funds is vital when considering the rate of return by these funds continues to be slightly negative in real terms and that has resulted in wide scale evasions. Bulk tea exports as a percentage of total tea exports has increased in 1999 compared to the same period last year, while value added teas have decreased over the past months. 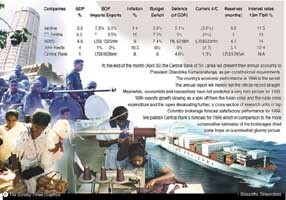 Asia Siyaka brokers say in a recent report that value added exports had dropped to 41 percent in 1998. Recent tea export figures for Jan/Feb 1999 show a 11.7 percent increase in bulk tea exports over the same period in 1998. This is a growth in the opposite direction of global trends. "Usually raw material suppliers tend to expand into production or value addition, but here is a situation where the industry is going backwards," Asia Siyaka Vice President, Anil Cook said. The industry should be looking at increasing the export of value added tea, which has been dropping lately. Bulk tea accounted for 62.5 percent of the total tea exports for the first two months of '99. Total local tea exports for the period though had declined to 36.4 billion kg from 44.2 billion kg in the same period in 1998, a drop of 17.8 percent over the previous year. This is mainly due low prices prevailing in the world markets. Inter monsoonal rains bringing in good cropping weather, improved offer quantities and low quantity teas will continue to be seen, a John Keells report said. "This would add further downward pressure to the price structure. In the present context, Colombo would be far better off if producers were to go for better product quality even with a drop in crop,"the report added.Meanwhile, Sri Lanka is set to lose a key market in Egypt following that country's entry into the Common Market for Eastern and Southern Africa (Comesa). Kenya's 60-percent share of the Egyptian tea market is set to rise sharply thanks to an 80-percent tariff concession for Comesa countries. Industry officials forecast that the Sri Lanka's 10-15 million kilogram share of the Egyptian market will shrink to about four million kilos this year following Cairo's entry into Comesa in February. The economic problems besetting another key Sri Lankan market, Russia, have also hit demand with an added complication presented by a special trading arrangement between India and Moscow.In a bid to tackle the growing crisis, the Sri Lankan Tea Promotion Board has been trying increase exports of high-quality teas to the Japanese market. Officials say that we should be lookig at protecting the existing market before going in search of new ones. The Asian Development Bank is to fund a major public sector reform project, which would cost about US$ 60-70 mn, a top government official said. ADB has appointed Arthur Anderson to do a comprehensive study of the various elements involved in public enterprise reform before privatisation of some sectors. The study will look at reforms in capital markets, pensions, labour markets and public enterprise re-structuring issues before their privatisation. Most important, the consultants will look at the regulatory framework that needs to be in place to implement a comprehensive range of strategies. The consultants will study the Build, Own and Operate (BOO) and Build Own and Transfer (BOT) projects that have been set up by the Board of Investments (BOI) to attract private sector into investing in much needed infrastructure projects, BOI chief, Thilan Wijesinghe said, at a seminar last week. They will look at how the BOO/BOT projects can be integrated in the overall sectoral strategies that are being followed for the port sector as well as the power sector, Mr. Wijesinghe said. "I am quite happy that the ADB has come forward and we are going to have concessionary financing available to meet the costs which sometimes can be painful to implement public sector reforms," he added. ADB has embarked on a three year strategy for Sri Lanka to be completed by year 2002. The Bank estimates to lend around US$ 120 mn each year during the next three years. 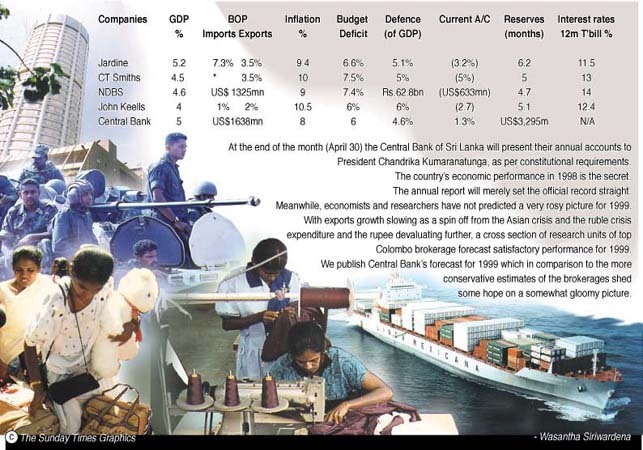 Since the country's external debt-service capacity is reasonably sound, Sri Lanka is in a position to absorb some official assistance at ordinary capital resources (OCR) terms and conditions, to achieve the targeted overall lending level. The overall assistance package for 1999 is expected to be over US$ 120 mn. Already, US$ 80 mn has been identified for the Colombo-Matara expressway, US$ 20 mn for a fisheries service management project and US$ 10 mn for a wildlife conservation project. The Bank has another US$ 20 mn standby project for schools development, which would provide technical and vocational assistance. A Malaysian investor has launched the first rural mass housing project in Watupitiwala. The first phase of the BOI project by Perpetual Business Lanka (Private) Ltd. is to build a minimum of 2600 housing units at four separate sites. The site in Attanagalla district is next to the BOI industrial zone in Watupitiwala, about 45 km from Colombo. "Malaysian investors were attracted by the concept of housing, which is well established in Malaysia," Chairman, Perpetual Business Lanka (Private) Ltd, Dr G K Ananda Kumaraseri told The Sunday Times Business . He believes that the supply of mass scale housing is not commensurate with demand in Sri Lanka and this project seeks to cater to this need. BOI status has conferred incentives on this project including tax holidays and development of infrastructure such as roads, water supply, said Dr Kumarasiri. The Housing scheme is part of an integrated township development project to provide facilities such as pipe borne water, underground sewage facilities, electricity, telephone services, paved internal roads, public park, playgrounds and a bus terminal. It is complete with commercial and business service complexes. The integrated development project is expected to generate employment opportunities for people residing in the Attanagalla district whilst generating socio-economic activities in the area. The plot sizes of the houses range from 6 to 20 perches while prices range from Rs. 450,000 to Rs 2 million; varying according to floor area and additional options chosen. An attempt is being made to accommodate modifications, alterations to existing designs and alternative designs of the houses. 20% of the houses are allocated for low cost housing on a minimum plot size of 6 perches. Architectural elements such as a "dhara kussiya" with an appropriately styled chimney have been integrated into the design. Open spaces interact with the design and are not left over space. The housing scheme targets low income, lower middle income and middle income groups. The prospective market is inclusive of residents of Attanagalla, professionals, executives and technical staff associated with the BOI Watupitiwala industrial zone. Having reached an unprecedented milestone by connecting 20,000 wireless local loop subscribers within 12 months in July 98, Lanka Bell has notched up yet another significant achievement by connecting more than 31,500 subcribers todate, says a company release. In just one-and-a-half years of operation as a telecommunications service provider, Lanka Bell has achieved more than any other fixed wireless operator, said a Company spokesman, and indeed is a remarkable achievement as has been acknowledged both internally as well as in the industry. Lanka Bell has become the preferred choice of most business as well as residential customers due to its ability to not only provide voice lines, but dial up data lines for internet and e-mail access, 64 KBPS (Kilobytes per second) leased circuits and other data lines upto 2 MB (megabytes) leased circuits. In addition Lanka Bell has made the conduct of business transactions more convenient by establishing business offices throughout its coverage areas, the appointment of Singer Sri Lanka as its dealer, having 36 Singer outlets/shops offering Lanka Bell services and the introduction of easy pay schemes for obtaining telephone connections through its exclusive financier, The Finance Co. Ltd.
Certain sections of the business community have appealed to His Holiness Dr.S. Burhanuddin Saheb to advise some members of the Borah community here to act with integrity and honesty in their business practices. This appeal has been made amidst allegations some Borah businessmen had indulged in malpractices or fraudulent deals which adversely affected others. They also referred to what they alleged were unethical moves to monopolise certain trades in Pettah. Some malpractices had caused millions of rupees in loses to other traders. "They overtrade and sell below cost, to cripple other traders so that they could monopolize the particular trades in the long run," he charged. The businessmen referred to the case of a trader who borrowed Rs. 200 million from a bank by allegedly fraudulent means.The bank losing as much as Rs.125 million. The bank had lost Rs. 125 million and could take no action since he had not given sufficient collateral and declared himself bankrupt. But he is now back in business, it is alleged. They alleged that some traders borrowed large amounts from banks, paying interest, sometimes camouflaging it by increasing the price of commodities, without showing the interest separately. Another case is that of a trader whose alleged malpractice's were brought to the notice of the public as a result of a question raised by Lakshman Jayakody(when he was in the opposition) in parliament. Mr. Jayakody asked the minister concerned as to why duty-free bonding was given to this person when he had been fined several times for numerous under valuations and debarred from leaving the country at the airport, till he paid a large fine that was imposed in one instant. An alleged racket in the import of exercise books, a few years ago was detected in one or two instances. Some consignment the importers were able to clear whilst they were not able to do so in respect of others due to the efforts of some manufacturers and a well-wisher. The result was a loss of Rs.8 million for the errant trader. They charged that unethical practractices, malpractice's, undervaluation and other bad practices were not in keeping with the precepts and preaching of His Holiness.They appealed to His Holiness to investigate such allegedly dishonest and fraudulent practices and ensure that these members of the community fell in line with the teachings. His Holiness Dr.S. Burhanuddin Saheb is in Sri Lanka for a regional Borah convention attended by hundreds of members. Even the IT specialists in the world of high-tech seem to dread the coming of the new Millennium; the year 2000 in numerical terms, when stored with only the last two digits is going to raise alarm and confusion in computer systems. In Sri Lanka, where most computer users do not seem to have done their home work and are being taken by surprise there seem to be only two options open; they must either upgrade their machines or go for new systems which are Y2K compliant. But there are also others who seemed to have sensed the inevitable transformation in advance and taken the necessary steps to have their systems ready to face the Y2K issue looming large in the computerised industry, Sarath Fernando, General Manager of Royal Ceramics Lanka Limited is way ahead. He had the foresight to put a comprehensive action plan in place. Royal Ceramics was mainly looking for a local single source - who would satisfy all their data processing needs and accordingly EDS was selected by Mr. Fernando and his team at Royal Ceramics. A team of ten project staff from EDS are currently training Royal Ceramics staff. They will be on a years training program, having been relieved of their normal duties to undergo the training full time. Book early if you are planning to be away from home at the Millennium is the advice coming from British Airways. With just nine months to go to the New year, seats on flights are being snapped up by passengers eager to celebrate the year 2000 in style, says Airline release. The Millennium period covers December 15, 1999 to January 9 2000. Nearly half a million seats have already been booked on the airline over the Christmas and New Year period - an increase of over 150 per cent on the same period last year - with the majority of passengers travelling to their destinations in plenty of time to celebrate the turn of the century. New York, Los Angeles, Johannesburg and Barbados are currently the favourite places to see in the New Year, with seats on these routes in great demand. The Finance & Guarantee Real Estate Consultants & Brokers Ltd, which is an arm of The Finance & Guarantee group and a member of Ceylinco Consolidated, has been appointed as the marketing agents for "Heinz Court Apartments" by UTA (Pvt) Ltd., a company release said. Heinz Court Apartments is situated in the heart of Dehiwala at No: 35, Albert Place and consist of 14 condominium apartments built to international standards by a team of reputed architects. lt is situated in a neighborhood packed with thoughtful features and modern amenities for those who dream of getting away from it all yet demand the ultimate in convenience. Here is the perfect escape with spectacular views of the ocean and the glorious sunsets. The latest IMF forecast of eco- nomic conditions expect a slight recovery of the World Economy this year. The good news is that the worst of the crises, which affected several regions of the world, are over and that these economies are on a recovery path. The world economy is expected to grow somewhat more in 2000. Growth in the international economy is vitally important to an export dependent economy such as ours. Our export markets respond to domestic conditions in importing countries. Sometimes their response is not owing to the actual conditions prevailing but expectations of the future. Tourism in particular is highly responsive to expectations. An optimistic society is likely to spend more on travel overseas. They are more likely to buy new products. People in modern societies spend not merely the money they have, but the money they think they can get hold of. The expected up-turn in the world economy is therefore favourable to our economy next year. Yet there are factors which may not be as beneficial as we might expect. In the first instance the Sri Lankan economy was not as adversely affected as South East Asian countries due to several specific features. Conversely this implies that the recovery itself will not benefit us as much. Our tea market was largely unaffected by the crisis as the South East Asian countries did not influence to any significant extent either supply or demand of tea in the international market. What did affect our tea was the tea production of East African countries and the Russian economy. Whether the Russian crisis is over is still to be seen. Similarly in the case of our largest and most significant industrial export, garments, the quota system and a competitive advantage helped us. Yet there were cracks in our export performance. What might be of as much significance as the global economic recovery, is the nature and extent of the recovery of Asian economies. Will some of the South East Asian countries emerge out of the crisis more competitive than before ? Will their recovery mean higher rates of inflation which would reduce their price competitiveness ? Would the reforms in these countries have enhanced their productivity and hence their competitiveness ? The answers to these questions would influence, if not determine, our export performance. Meanwhile what has been happening to our exports ? Last year our total exports grew by only 2 per cent. And this increase was largely due to a good performance in the first part of the year. Although our industrial exports grew by 3 per cent, this was entirely due to a healthy 8 per cent growth in garment exports. All our other industrial exports together declined by nearly 7 per cent. This is indeed the danger signal. Understandably rubber manufactures suffered most. It must also be recognized that our export performance in 1998 was by far the worst since 1994. Exports grew by an average of 17 per cent in 1995 - 96, compared to a growth of only 7 per cent in 1997 and a little over 2 per cent last year. An important issue over which we must ponder is whether the export performance was only due to the global crisis or are there internal factors which are inhibiting our export capabilities. Many industrialists seem to think the latter is also significant. If this is so then the world economic recovery may not benefit us as much as we may expect. In any case putting our own economy in order is a pre-requisite to a robust export performance. Recent financial crises have spotlighted the importance of effective supervision and regulation in maintaining sound financial systems. For the home and host country authorities, however, offshore financial centres can pose added prudential and supervisory issues.In this interview, Luca Errico, an Economist in the IMF's Monetary and Exchange Affairs Department, and Alberto Musalem, an Economist in the IMF's Policy Development and Review Department, review the role of offshore banks and the part these banks played in recent crises.Drawing on the findings of their recent Working Paper, they argue that effective implementation of existing prudential and supervisory frameworks could go a long way toward containing risks. IMF SURVEY: What are offshore banking centres, and what prompted their development? MUSALEM: Offshore financial centres are jurisdictions, not necessarily countries, where financial institutions are exempt from a wide range of regulations normally imposed on onshore financial institutions. Deposits in offshore banks, for example, are often not subject to reserve requirements, and bank transactions are treated under favourable fiscal regimes. In many instances, offshore banks are also exempt from scrutiny with respect to liquidity and capital adequacy. Typically, offshore banks deal with other nonresident financial institutions and transact a wholesale business in a major currency other than their own. The growth of offshore banking during the 1960s and 1970s was largely in response to the imposition of distortionary regulations, such as reserve requirements, interest rate ceilings, and capital controls in the industrial countries. A number of factors—including favourable fiscal regimes and regulatory frameworks (which lead to higher profitability), access to international capital markets, and the possibility of engaging in illegal activities such as money laundering - continue to attract business to offshore financial centres. IMF SURVEY: What proportion of international finance is carried out through offshore banks? MUSALEM: Currently, at least 69 offshore financial centers are in operation around the world. The cross-border assets of offshore financial centres grew at an estimated annual average rate of about 6 percent during 1992-97, reaching $4.6 trillion at end-June 1998. In mid-1998, offshore financial centres accounted for 51 percent of total cross-border assets. These figures, however, may underestimate the true size of offshore banking, because the reporting of offshore banking data to the Bank for International Settlements (BIS) is not yet complete. Offshore banks chiefly engage in three types of transactions: eurocurrency (including eurodollar and euroyen) loans and deposits; the underwriting of eurobonds; and over-the-counter trading in derivatives for risk management and speculative purposes. Since eurocurrency transactions make up the bulk of offshore banking operations, the activities of offshore financial centres are predominantly of an interbank nature. IMF SURVEY: Do offshore banks play different roles in industrial countries and in emerging economies? MUSALEM: Industrial countries have dismantled the distortionary regulatory frameworks that first prompted the growth of offshore banking. They now permit competition within the context of prudential supervision and capital account convertibility. With this change, the distinction between offshore and onshore banking is becoming more and more blurred. In fact, the share of cross-border assets intermediated through offshore centres catering to industrial countries has declined over the 1990s. But offshore activities remain an appealing alternative for banks operating in the sometimes heavily regulated financial markets of emerging economies. Excluding the United Kingdom and Belgium-Luxembourg — because they cater mostly to industrial countries — the share of cross-border assets in relation to emerging markets has increased over the l990s . Over the same period, the net crossborder liabilities of Asian offshore financial centers doubled as a percent of cross-border assets. IMF SURVEY: To what extent do offshore banking centres complicate supervision for home and host authorities? ERRICO: Offshore banking transactions are, by their nature, less transparent than normal cross-border banking. The complex corporate relationships between onshore parent banks and their offshore establishments - that is, their offshore branches and subsidiaries can be exploited for dubious purposes, given the opportunities for regulatory arbitrage that offshore financial centres offer. Also, gaps or disagreements in the existing regulatory and accounting frameworks, coupled with the technology for money transfers currently available, make financial surveillance more challenging and difficult. For example, while normal cross-border banking involves home and host supervisory authorities, offshore transactions carried out through shell branches — that is, booking offices for transactions arranged and managed from other jurisdictions — may involve three supervisors, thus complicating supervisory coordination. Similarly, offshore activities carried out through parallel-owned bank - that is, banks established in different jurisdictions that have the same owner(s) but are not subsidiaries of one another — are impossible to detect in the absence of adequate information disclosure arrangements. IMF SURVEY: Are certain offshore banking activities riskier than others? MUSALEM: It is hard to distinguish between the different activities in terms of risk, especially in comparing off and on-balance-sheet transactions, but there is evidence that offshore banks exploit the risk-return trade-off so frequently found in finance. Favourable regulatory treatment increases the leeway for balance-sheet management. This makes offshore banks more profitable and, in many instances, also more leveraged (more risky) than their onshore counterparts. Contagion onshore is also an issue, because onshore parent banks are in practice responsible for their offshore establishments. A large, leveraged, and under-regulated offshore establishment can easily sink its onshore parent bank. The predominantly interbank nature of offshore banking also raises the issue of contagion from one bank to the next. lMF SURVEY: Have offshore banks played a role in recent financial crises? ERRICO: There are clear indications that offshore banks did play a role in recent financial crises, notably in Latin America and Asia. In Latin America, parent banks transferred part of their banking franchises to, and/or booked higher-risk assets or classified loans with their offshore establishments to escape prudential requirements in their home countries. ln Asia, parent banks onshore used their offshore establishments to channel short-term, foreign-currency-denominated funds through interbranch transfers. These transfers avoided reserve requirements, increased leverage, and added to the risk of balance-sheet mismatches. We did not deal with this issue in the paper, but the overseas operations of Russian banks and financial companies could also be cited as germane to the Russian crisis last August. IMF SURVEY: Is greater regulation of offshore banking called for? ERRICO: The international supervisory community has made several efforts to regulate and supervise internationally active banks, including banks operating in offshore financial centres. Current prudential and supervisory frameworks developed by, among others, the Basle Committee for Banking Supervision and the Offshore Group of Banking Supervisors are broadly adequate for risk management, if these frameworks are effectively and universally implemented. We believe that fine-tuning, upgrading, and harmonization of existing regulatory measures for prudential supervision and corporate governance would be preferable to greater regulation. But a number of supervisory gaps remain that, coupled with heterogeneous accounting standards, may impede effective consolidated supervision of offshore banking activities. These problems need to be addressed. IMF SURVEY: Is there a role for the IMF in this area? ERRICO: Personally, I believe there is. The IMF can play an important role within the context of ongoing efforts to strengthen the architecture of the financial system. For example, the Financial Stability Forum set up in February this year could be an effective vehicle to promote the monitoring and regulation of the offshore financial centres. The IMF could assist in this process through its surveillance and technical assistance activities. Specifically, the IMF could play a crucial role in disseminating international best practices and standards for effective consolidated supervision of offshore banking in much the same way that it is promoting the Basle Committee's Core Principles. The IMF could also strengthen collaboration with other organizations involved with specific aspects of offshore banking, such as the Offshore Group of Banking Supervisors, the Joint Forum on the Supervision of Financial Conglomerates, and the Bank for International Settlements.